Matrix organizational chart is a popular organizational chart that defines more complex structures to emphasis efficiency, creativity and innovation. Matrix organizational chart is a popular organizational chart that defines more complex structures to emphasize efficiency, creativity and innovation. It is used to describe the areas of communication on a matrix-shaped chart for smaller companies. A matrix structure involves no set divisions or departments. It focuses on hierarchy with multiple levels of communication responsibilities in a company. Employees may develop their own projects and assemble a team to work on them. Or the company may be organized around customers, with different groups assigned to different customers. Matrix organizational chart is more complex than traditional organizational charts such as functional organizational chart, divisional organizational chart and hierarchical organizational chart. However, the matrix organizational structure allows for better understanding of organization structure where various levels may answer to more than one department master. In organizations where there are multiple departments that share authoritative responsibilities, a matrix organizational chart is the most effective way to present communication. 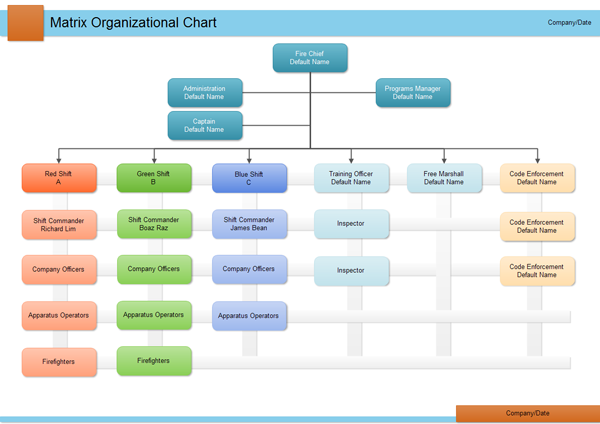 Below is an example organizational chart, showing a simple matrix organizational chart in a medium size company. Click here to free download Org Chart Software. Then you can use the built-in templates to present your Matrix Organizational Charts in minutes.